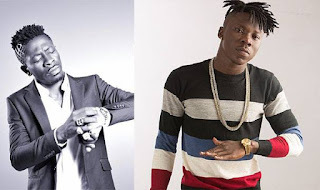 Latest signing of Zylofon Media act, Shatta Wale has opened up on his relationship with fellow dancehall artiste, Stonebwoy. The two dancehall artistes who have been purported to be arch-rivals are now on the same record label. The dancehall artist who was signed to entertainment giant Zylofon media yesterday during his first performance as a Zylofon media artiste stopped singing and revealed that Stonebwoy was still his enemy. Shatta Wale is reported to have said that joining Stonebwoy under one record label does not make them friends. He revealed that Stonebwoy will remain a brother in the confines of Zylofon, but if they stepped outside, Stonebwoy will still be considered his ‘enemy’. “You see as I come here right now, I no say people go think how ego do Stonebwoy, you see Stonebwoy, for here e be my brother! For town e be my enemy! E be so we dey come do the thing e no be say play play thing”. He said. The two award-winning artistes however made headlines last year on social media when the two shared the same stage at Stonebwoy’s “Ashiaman to the World” concert. Stonebwoy is out of the country for his “Epistle of Mama” album project.